Microsoft is rolling out their latest window’s upgrade. So, of course we were curious about the packaging and checked out the Windows Blog to see what they had to say. One of the challenges Microsoft was facing in designing its packaging was the stigma of the Vista packaging which almost needed dynamite to open it. 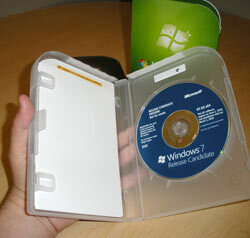 A quote from Microsoft about their packaging reveals, “We approached the packaging for Windows 7 the same way we approached the product – by listening to what our customers told us they wanted: make it a simple clean design, easy to open, and reduce waste.” So, rest assured, Microsoft listened and has improved the packaging. The graphics are clear and bold. They text font is larger and easier to read. Each version has its own distinct color which makes it easy to identify which version of the operating system you are picking up. The cover graphics are simple and minimal which gives the packaging a fresh and clean feel. The upgrade disc comes in an easy opening, recyclable, frosty clear DVD style case. The case is shaped with the iconic curve on the upper right corner. For security reasons, there will be a seal on the top of the case which is claimed to be removable with little effort. So, we give kudos to Windows for listening to consumers and giving them the packaging they want.